February 7, 2019 February 21, 2019 Posted in Barcelona, Real Madrid, When? It was the height of modern footballs answer to Muhammad Ali v Joe Frazier, the ‘fight of the century’ between Pep Guardiola and his antithesis José Mourinho. There were no rhyming phrases like ‘Thrilla in Manila’ for the finale, but it was still a heavyweight scrap between the two biggest clubs in world football: the greatest club side in the history of the game to many, against the negative, aggressive, yet hugely effective Real Madrid side of the man who once sat in the Camp Nou dugout as translator and de-facto assistant to Bobby Robson. Mr Robson was the unfortunate man to have the first job in the post-Cruyff era, he had the fans on his back from day one, but this man – Pep Guardiola, ex-Barca player icon – was the Blaugrana hero who led Barcelona back into the thinking of Total Football. José Mourinho, Robson’s former right hand man, was the man tasked with ending Barcelona’s monopoly over La Liga (and the world) – after all, he was the man who got the better of Guardiola in the Champions League with his Inter Milan side. This catalogue of games was enough for a Hollywood movie, four games with a billing worthy of Oscar nomination. It was sports psychology at its highest. Matchday 3 and 4 in the Champions League group stage is often dubbed the chance for tacticians to shine (as teams play each other back to back, two weeks apart), this was a mixture of how to balance tactical know-how, mental fatigue, physical detriment, all put together with the biggest managerial rivalry for decades. Revolutionary ex-AC Milan boss Ariggo Sacchi described the duo as ‘two Pablo Picasso’s in one period’. That, like a lot of things Sacchi has said or done in the game, was spot on. The rivalry started over a decade prior, or at least the friendship that led to the feud did. Barcelona had just won the Cup Winners’ Cup final in Rotterdam against PSG, against the declining French side Paris Saint Germain. As players often do when they win a big game in sport, Guardiola – sporting a thin haircut and short shorts with the number 4 – fell to the ground in celebrating. It was the first season without the great Johan Cruyff at the helm, so this trophy felt like a big one for Barça. As Guardiola got to his feet, he clocked a member of the club’s staff, who he ran to with inviting open arms. That man, of course, was Mr José Mourinho. Over the coming years, José’s character blossomed into what we know him as today. They met on opposing benches for the first time in 2009, when they played out a 0-0 in Italy, before Barcelona won 2-0 at the Camp Nou. These two matches were only in the group stages, and Mourinho’s demeanour perhaps foreshadowed what was to come. Mourinho had worked out Pep Guardiola’s Barcelona, and when they met in the semi-finals later that season, he put that plan into action. Jose Mourinho’s Inter Milan defeated Barcelona over two legs. The great Barcelona side, with Messi, Xavi, Iniesta – the list goes on – were humbled. Over in Spain, the Madrid hierarchy were standing up and taking notice of Mourinho, the man who had now conquered Europe with two teams – Inter and Porto – as well as his record breaking Chelsea side. Not long after, Florentino Perez sanctioned the deal – Mourinho was the man they tasked to end the Barcelona rule under Guardiola, and this set in motion a few seasons of politics, power, scrutiny, and in short, football entertainment of the highest order, for the neutral anyway. By this point, Guardiola had stopped going the gym. He used to spend up to two hours a day working out, a keen believer of the ‘healthy body, healthy mind’ theory. The first showdown was tame, almost as if the teams were nervous – which was certainly the case. Like a sparring match, or the first 20 minutes of a big match anywhere in the world, both teams were content with a draw. For Barça, the draw meant that the title was all but sealed. For Madrid… well, they were just happy to not lose. 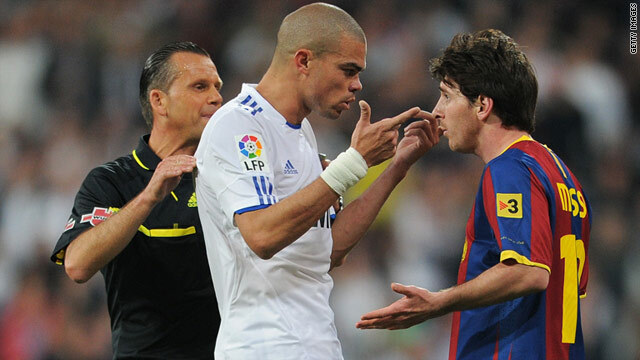 The only real talking point that was memorable was the tight marking of Lionel Messi by the hardman Pepe. The Argentinian wizard rarely gets agitated, but when he does, you know. This was one of those occasions, with some of his team mates having to calm him down from frustration. It wasn’t the first and certainly wasn’t the last time that Messi was almost unfairly marked out of the game with aggression and strength, but Messi got particularly wound up this time. Four weeks is a short time to prepare to play the same team again, never mind four days. Yet just four days after the mundane one all draw in Madrid, José Mourinho’s men had a huge advantage, both psychologically and tactically (unless you class those as interlinking). Although it took an extra time strike from Cristiano Ronaldo to win the game and trophy, Real Madrid were deserved winners, and Mourinho had got one over on his arch enemy. The final may best be remembered for what happened off the pitch, with two contrasting events. The first was in the direct aftermath when Lionel Messi stormed into the dressing room and sat on the floor crying, uncontrollably. He is a born winner, and the thought of losing escapes Messi. On the other hand, Sergio Ramos got so caught up in the celebrations that he dropped the trophy off an open top bus parade. Who did this affect more psychologically? The Barcelona team who spent the whole journey home in pretty much silence on the coach? Or was it Madrid, who celebrated not just the win, but the fact they knew, or thought, they had the upper hand going into the Champions League ties in the coming week. The problem went beyond Pep’s mental endurance, writes Guillem Balague in his book ‘Pep Guardiola: Another Way of Winning’. “The constant friction made it difficult to take the right decisions, his juggling of so many roles – figurehead, coach, beacon of the club’s values – was becoming too much to bear”, continued Ballague. Reportedly, one of Pep’s closest friends heard him threatening to leave Barcelona due to this mental fatigue. For him, every trophy – the entire campaign – was being contested against the eternal rival in the period of eighteen days. It is sports psychology at the highest order. Mourinho had got to him, Guardiola was rattled, you could say. He was feeling the pressures of management like never before, and despite the fact his team was widely tipped the best in the world, he wasn’t enjoying a minute of it. He had to somehow sell each Clásico different. He couldn’t brief the team the same four times, nor he couldn’t praise them too highly for any good things as they may slack. Guardiola had to balance more than he felt he could. He needed some sort of uplift psychologically. That psychological lift came from the most… likely source. Guardiola often used weird techniques to lift his team ahead of big games. In one of his Champions League finals, he showed them a highlight video of their highlights to get them in the mood. In another, he simply said ‘Do it for Abi’, referring to Eric Abidal, who had recovered from cancer to make the final. This time, it was a speech in a press conference aimed in response to a personal attack from Mr Mourinho, who accused Guardiola of unfair play for moaning about refereeing decisions. The Champions League two legged semi final had just started. Guardiola returned back to the dressing room to a standing applause from the team, led by the midfield diamond Xavi Hernandez. Mourinho’s off the pitch strategy had not worked, it had done the opposite – motivated his opponents. On the pitch, Barcelona were by far the better team, and two late Lionel Messi goals secured a 0-2 victory for Guardiola’s team. Mourinho continued, though. The turning point in the match was the sending off for Madrid’s key defender – Pepe. The Portuguese international was the one tasked with marking Messi out of the game, which he did well for sixty minutes, before his red card. Following this, Mourinho remarked that Barcelona had the referees on their side and that Guardiola should be ashamed, saying that he would not want to win the Champions League that way. Via saying Guardiola was going to win the Champions League, Mourinho was playing his old trick of telling the press he thinks his side are out of the competition. Guardiola disagreed, knowing there was still work to be done: “A team that has won nine European Cups can never be written off”, he said. The fourth and final Clásico wasn’t as eventful as the others, the calm after the storm like an action movie with a happy ending, for Barcelona at least. The game finished one goal apiece and Barcelona qualified for the Champions League final. Pep Guardiola, and his players, were shattered, as were the fans I imagine. Four Clásico’s in 18 days is ludicrous and a huge test of mentality. Barcelona came out victorious, and went on to win the Champions League that season with a victory over the great Manchester United, led by Sir Alec Ferguson, a hero of Pep’s when he was first getting into management. The biggest test of sports psychology that either manager will face, and one that has shaped their careers. With three in 25 days now, as well as Guardiola’s City side going for a gruelling four trophies, these experiences may come in handy.